815 PHAT Loops in TOTAL 550 megs of phat drum sounds!! Loops From The Legendary Drum Machines, Rythm and Blues Loops, Slow Acoustic Drum Loops, Funky Breaks, BFA Rush Drum Loops, Ambient Studio Drums, Brian Daly Rock Beats, Hip Hop Philosophy Loops, Slick Drum, Slow Ludwig Kit, Street Beats, Twisted Trip Hop, Westside Underground, Zero-G Hip Hop Loops and much more! If you are looking for any of these drum sounds, just click back here to check out our products. 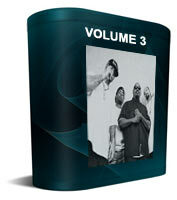 Volume 3 815 PHAT Loops in TOTAL 550 megs of phat drum sounds!! Loops From The Legendary Drum Machines, Rythm and Blues Loops, Slow Acoustic Drum Loops, Funky Breaks, BFA Rush Drum Loops, Ambient Studio Drums, Brian Daly Rock Beats, Hip Hop Philosophy Loops, Slick Drum, Slow Ludwig Kit, Street Beats, Twisted Trip Hop, Westside Underground, Zero-G Hip Hop Loops and much more! Over 800 16 bit - 44.1k Drum Loops, very high quality.